I love upcycle crafts that don’t resemble the item they are upcycled from. 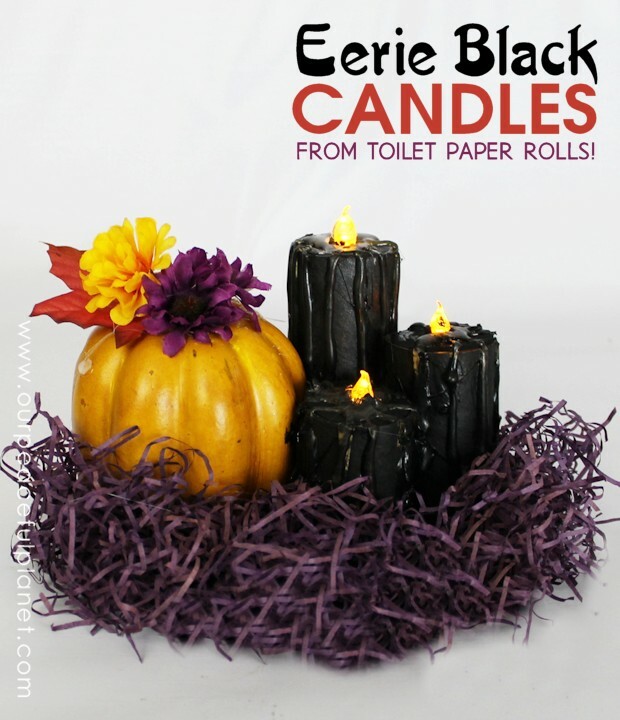 This Halloween Decor fits the bill and they are so fun to make! You can of course make them any color for any holiday. Everything you need can pretty much be bought from the dollar store. I made mine into a table setting by adding a small pumpkin (again, from the dollar store) and some shredded purple paper stuff I had. Then I glued it all on a painted paper plate. Every step is shown below with my notes. I love this can’t wait to try it . Could use with different colors of paint too. Is it hard to turn tealights off and on? I tacked my candles down lightly as you do have to pull them up if you need to switch the lights off an on. They are fairly cheap though so you could possibly let them run for a season… depending on the life of your tea lights, then just replace them next season. Thanks, Nancy! Such a neat project.